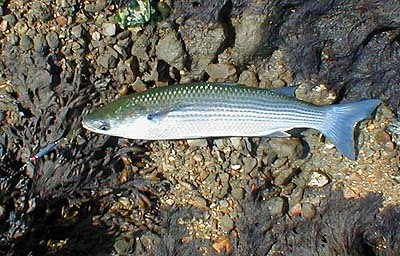 Recently I had an E_MAIL from my friend Mark Loose telling me that he had been catching thin lipped mullet from the shores of Poole Harbour. Mark is more experienced at catching the local thinlips than anyone else I know so when he asked me to join him it was an offer too good to miss. He even supplied the bait - a couple of dozen ragworms and met me down by the beach. It was dead low water of neap tides when we arrived and within minutes Mark called out that he was into a fish. He uses his own, highly effective, rig. 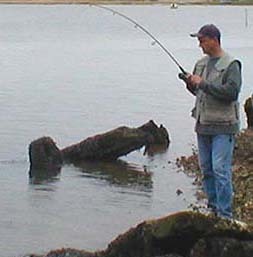 This consists of two spoon blades ahead of the baited hook and because of the strong flow of tide where we fish, he uses a ball weight ahead of the spoons. No weight is needed if there is no flow of water. My own gear is the bead-bodied, Mepps-type, home made spinner that I use for thinlips in the river. I have also made some spinners with barrel weighted bodies to avoid the need for an uptrace 'lead'. The fish were biting quite well and we each landed several before we packed in and went home for lunch. Mark kindly left me the remains of the bait and I went down for a couple of hours the following day and landed several more nice fish. 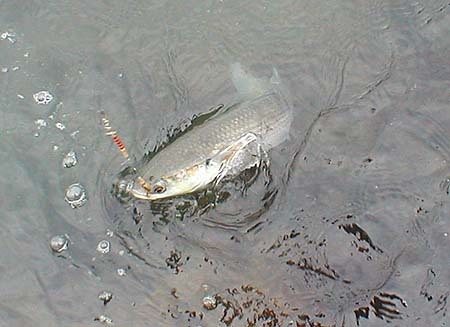 The mullet will take on the retrieve or when the lure simply hangs and ticks over in the current. It is a matter of judgement how fast and deep to reel in for any given set of conditions. 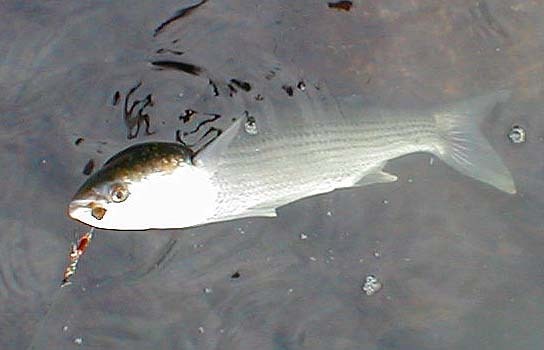 Thinlips are beautiful fish and can be relied on to oblige under a wide range of time, tide and weather conditions. As the tide speeded up little eddies developed and scum collected on the surface of the water. 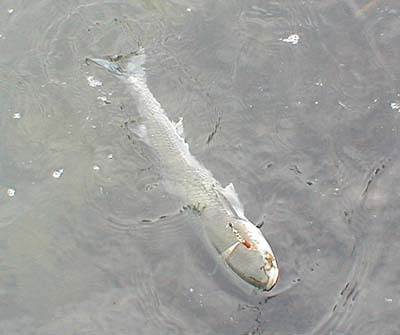 It was not long before a decent shoal of mullet were gulping in the surface scum. Next time we'll take the fly rods!!. A thin lip almost beaten. A mullet caught on my second trip. !